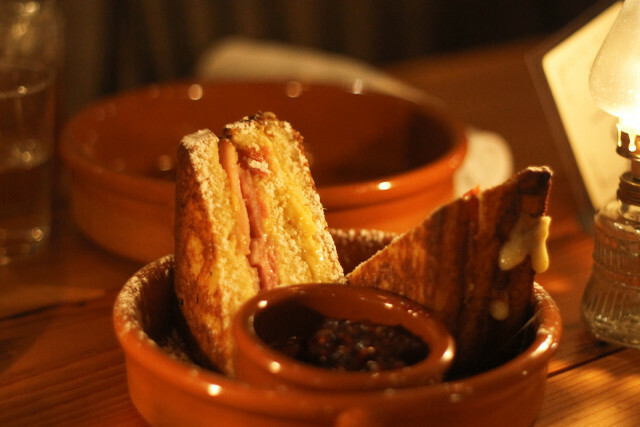 The Monte Cristo with smoked turkey, ham, and Gruyere served with a sweet side of raspberry jam. Caleb McBee stands inside his white cinderblock bunker on the corner of E. Burnside and 55th, his long braids swinging back and forth through the open kitchen. 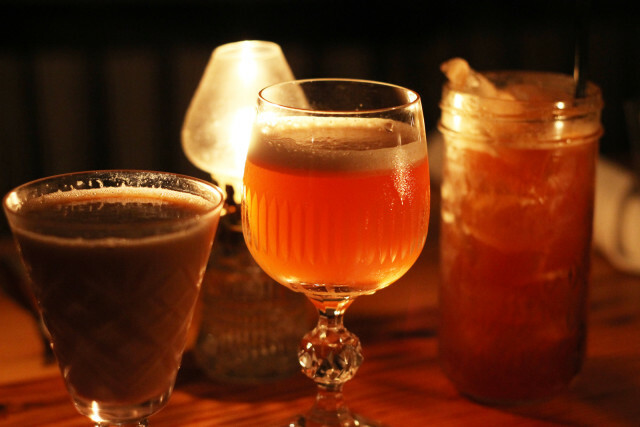 His new space, Tannery Bar, quietly reopened late last month, this time with the focus squarely on the drink program. The revamped bar is cozier than ever with a no-frills, wallet-friendly food menu and seriously fresh cocktails. When I first wrote about the Tannery Bar space last year (then Skin & Bones), it was a tiny, hyper-local bistro making bold moves in a notoriously challenging restaurant neighborhood. “Neighborhood folks were crying out for more drink,” says McBee, “—the format wasn’t easy to absorb.” With a new 10-seat chef’s counter, a dining room downscaled to two large communal tables, and a triple-decker DJ-station spinning Japanese crooner records, Tannery is flush with thirsty locals and flirty couples lingering in McBee’s new brand of farmhouse chic. The most obvious change is to the black-bordered bar where former Ned Ludd general manager Marc Dyer mixes up “Tannery Creations,” alongside a taxidermied boar’s hoof and supersized turkey wishbone. The move towards a booze-heavy reboot is a nod to McBee’s former Apotheke, a modern Scandinavian digestif dispensary in the Pearl that shuttered in 2008. Now they’re serving cocktails on par with some of Portland’s best, with concoctions like A Pear in the Forest, (Clear Creek pear brandy, Douglas fir, floral Orgeat, egg white), and the Quince Jones (White Dog whiskey, sour Byrrh, quince shrub, and soda for loft) along with a short list of biodynamic and organic wines, and “vintage” barley wines fermenting on the counter. The food menu remains unchanged in its vision of comforting, from-scratch cuisine, but comes abridged as a list of elevated “bar snacks,” most under $10. A heavy cloud of creamy mashed potatoes an inch thick covers earthenware filled with melted lamb neck stew—the ultimate winter comfort. An archetypal Monte-Cristo on Pullman bread emerges with thick strata of smoked turkey, ham, and Gruyere, puffy with egg batter, and served with a sweet side of raspberry jam. Other offerings are less approachable. A plate of mussels in a spicy tomato stew and golden-crisped frites cries out for more sauce, and jagged duck wings fall flat next to bitter cherry gastrique. Early hiccups aside, the Tannery Bar space finally seems to be growing into itself as a great neighborhood watering hole rather than a pricey prix fixe destination.